Whilst she was speaking, a frog put its head out of the water, and said, 'Princess, why do you weep so bitterly?' 'Alas!' said she, 'what can you do for me, you nasty frog? My golden ball has fallen into the spring.' The frog said, 'I want not your pearls, and jewels, and fine clothes; but if you will love me, and let me live with you and eat from off your golden plate, and sleep upon your bed, I will bring you your ball again.' 'What nonsense,' thought the princess, 'this silly frog is talking! He can never even get out of the spring to visit me, though he may be able to get my ball for me, and therefore I will tell him he shall have what he asks.' So she said to the frog, 'Well, if you will bring me my ball, I will do all you ask.' Then the frog put his head down, and dived deep under the water; and after a little while he came up again, with the ball in his mouth, and threw it on the edge of the spring. 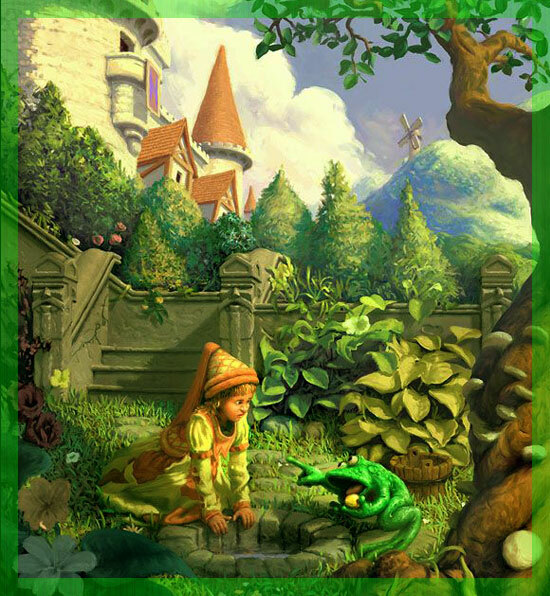 As soon as the young princess saw her ball, she ran to pick it up; and she was so overjoyed to have it in her hand again, that she never thought of the frog, but ran home with it as fast as she could. The frog called after her, 'Stay, princess, and take me with you as you said,' But she did not stop to hear a word. The young princess, you may be sure, was not long in saying 'Yes' to all this; and as they spoke a gay coach drove up, with eight beautiful horses, decked with plumes of feathers and a golden harness; and behind the coach rode the prince's servant, faithful Heinrich, who had bewailed the misfortunes of his dear master during his enchantment so long and so bitterly, that his heart had well-nigh burst.